Deep within the Philippine jungle, amongst the unbearable humid temperatures, cannibal tribes and marijuana fields, a film crew gathered with seemingly unlimited funds, led by one of the most accomplished directors of his generation. The film was Apocalypse Now and the director was Francis Ford Coppola. His aim was to shoot a film covering the real Vietnam War, a film he states will “be the first movie to win a Nobel Prize”. The film has since been recognised as having successfully portrayed the confusion and chaos that spawned for the duration of the Vietnam War. It was during the filming of Apocalypse Now that Coppola’s mental health, along with many other members of the cast and crew was severely tested. Throughout the production a camera and tape recorder was turned in the direction of Coppola and the footage that subsequently emerged shone a new light on not only the making of Apocalypse Now but also on filmmaking itself. Brandon Sieve, in his article in Film Matters, examines the documentary Hearts of Darkness: A Filmmakers Apocalypse, which was released some twenty years after the making of the film. The documentary contains narration and original footage taken by the then amateur filmmaker, Eleanor Coppola, Francis’ wife. Having taught herself how to use a 16mm camera she embarked to capture everything that took place behind the scenes, in the attempt to produce a short 5-minute presentation that United Artists could use as promotional material for film festivals and publicity events. 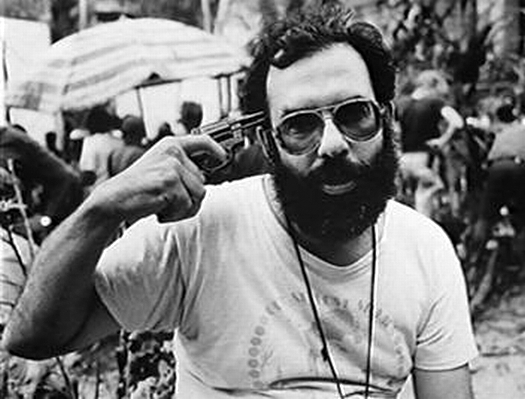 What Eleanor eventually shot was the over 60-hours of images and sounds that recorded the demise of Coppola’s state of mind in such dramatic circumstances that the documentary arguably becomes a more emotional journey than the feature film itself. Much of Eleanor’s footage was given to first-time filmmakers Fax Bahr and George Hickenlooper who contributed to this material by conducting interviews with those involved with the film two decades after the original ordeal. The scenes that emerge from combining original footage with reflective interviews delivers a very honest portrayal of filmmaking, as the viewers watch members of Hollywood’s elite openly discuss their experiences of the apocalyptic events that took place in 1976. One of the reasons this documentary is so engaging and entertaining while still maintaining an honest portrayal of its subjects and narrative is due to the many conventions and modes of documentaries it uses to tell the story. He explains how combining archive footage of the Vietnam War with interviews taken during and post-production together creates a comprehensive and transparent portrait into filmmaking. The film is mainly presented in a Reflective mode, which doesn’t just ask the viewers to see through the documentary, but to see the documentary for what it actually is. …a heightened form of consciousness about their relation to the documentary and become more aware that what they are witnessing is a construct. This method can sometimes be destructive but in documenting Apocalypse Now and observing all that happened during its filming, the audience is subjected to an incredible array of emotions and drama that would require even the most creative mind to conjure up. It is through the use of another mode that encourages the audience to be emotionally involved in the images they witness, which enforces the ‘heightened form of consciousness’. The extensive use of interviews of both the cast and crew allows the audience to be addressed directly, thus bringing into focus the Expository mode of documentary filmmaking. The result of using such modes creates a unique insight into the making of the film where the audience is told of what really happened during the filming, a perspective that does not usually come to light. It doesn’t take long before the viewer’s sympathy piles on Coppola as the audience learns about more setbacks to the production. It is Eleanor’s original footage that provides the window for the audience to witness the steady demise of Coppola’s mental health, and it’s easy to see why. This line perfectly encapsulates the mysteries shrouding the Vietnam War. The vast majority of American citizens had no idea what the day-to-day happenings were and what direction the war was taking. The trouble was neither did the soldiers. Francis set out to achieve this depiction of the war through a fictional narrative, yet Eleanor has captured this sentiment as an actuality through her honest approach of filming everything on set and has, as a result, provided the greatest, and darkest insight into filmmaking. Tags: Apocalypse Now, filmmaking, Francis Ford Coppola, Hearts of Darkness documentary. Bookmark the permalink.